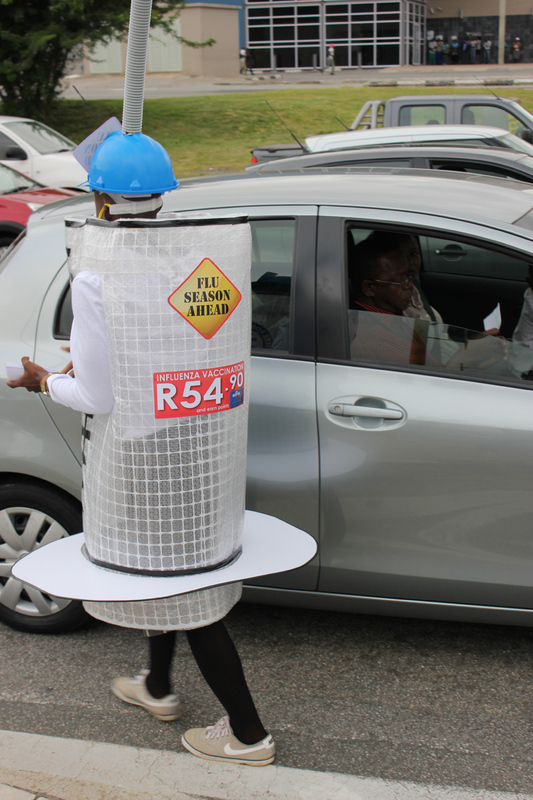 Mopani Pharmacy recently took a novel approach to promote getting vaccinated against flu this year.Students Reuben Mnisi and Mthokozisi Nyalunga dressed up as giant syringes and took to the busy traffic intersections in Nelspruit and White River on Friday 22 February to hand out flyers. 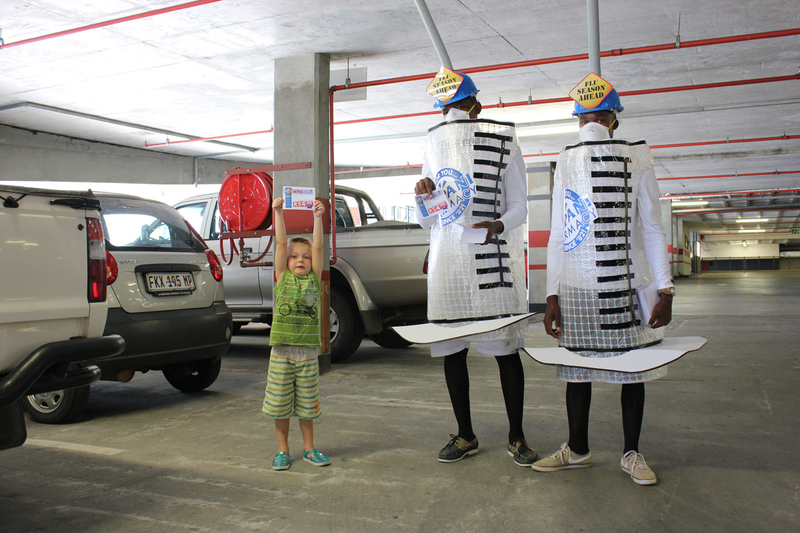 They also spread awareness on Saturday at I’Langa Mall. The public was highly entertained by the two friendly dancing syringes whose costumes were made by Mopani’s graphic designer, Barry Odendaal. Flu – also scientifically known as influenza – is a highly contagious respiratory infection caused by the influenza virus. Getting the flu vaccination is the most important way to reduce one’s chances of contracting flu. Due to slight changes in the genetic material of the influenza viruses A and B, new virus strains emerge each year. The emergence of new strains and the fact that the flu vaccine is only effective for 8 to 12 months means that vaccines have to be updated each season. The 2013 flu vaccine is now available at Mopani. No appointment is needed. For more information contact the pharmacy on 013 755 5500. 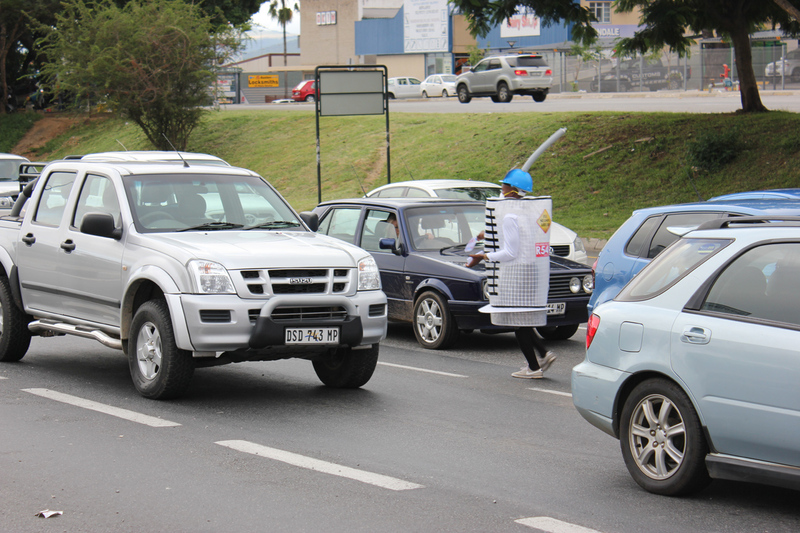 Reuben Mnisi in action during a recent campaign by Mopani Pharmacy spreading awareness for getting the flu shot. Mopani students Mthokozisi Nyalunga and Reuben Mnisi dressed up as syringes over the weekend to promote getting vaccinated against flu. Little Riley Odendaal eagerly helped out. The 2013 flu vaccine is now available at Mopani Pharmacy. A close up look at the novel syringe costume donned by student Reuben Mnisi to promote the 2013 flu vaccine now available at Mopani Pharmacy. 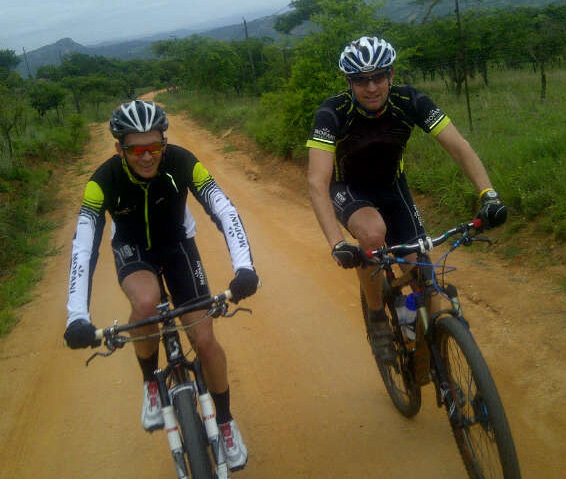 Team Mopani’s cyclists, Bertus van der Linde and Louis Botha. What started out as a hobby quickly turned into a lifestyle for Team Mopani’s cyclists, Bertus van der Linde and Louis Botha. Last year they competed in twenty local races, achieving several podium finishes. Highlights include the Isuzu 3 Towers Challenge (they came 2nd sub vet and 11th overall), the Big Induna 40km (Van der Linde finished 1st and Botha 3rd in the sub vet category) and the Forest to Falls 35km (Van der Linde 2nd and Botha 7th sub vet). They also dominated the 25km Das Auto Series finishing 1st (van der Linde) and 3rd (Botha) sub vet men overall. Van der Linde was also awarded a cycling commendation at the 2012 Valencia Celebration of Cycling awards ceremony for placing 1st overall men in the Das Auto Series. Both men say they initially took up cycling as a hobby and to combat stress – Botha used to suffer from high cholesterol and Van der Linde was an active smoker. They met some three years ago whilst out riding in the same neighbourhood and soon thereafter began training together. “We just gelled,” says Botha. “We have similar cycling styles and share a strong synergy – this helps us to drive and motivate each other to perform our best and of course, also adds a fun component to training and competing.” Although they’re focussed on team events, they tend to complement and encourage each other even when participating solo with Botha chasing Van der Linde to go out hard and vice versa. Team Mopani came into being two years ago when they signed up as brand ambassadors for Mopani Pharmacy. Since then both Van der Linde and Botha have truly embraced the pharmacy’s healthy lifestyle motto. Not only do they focus on good nutrition, best training practices and looking after their bodies, they also strive to inspire young people to live healthily and are on a constant lookout for ways and means to uplift disadvantaged cyclists. And being two of the most pleasant and approachable cyclists out there on the Lowveld’s cycling circuit, they’re always ready to offer advice or simple encouragement to their fellow cyclists. This year they’re shifting their training routine towards a structured program under a professional coach’s guidance. They believe that with the right supplements, backing and training even greater achievements are possible. They also try to put in ten training hours per week – which is commendable since both men have families and full time jobs and spare time is often limited. Furthermore they’re currently in discussion with the pharmacy to host cycling clinics where the focus will be on training and nutrition. There are also hopes of enlisting a well known local cycling coach to share his expertise. For more information on these clinics keep an eye on Mopani’s Facebook page and web site. Alternatively contact Vincent Morse on 013 755 5548.